Seen and heard at the Galen Center during Arizona's 73-66 win over USC. 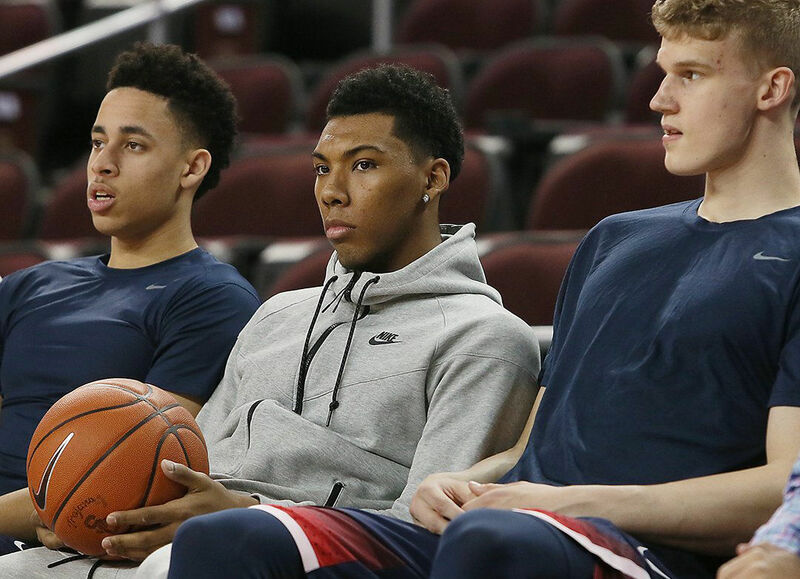 As much as the Arizona Wildcats may need Allonzo Trier, he may need them just as much. Trier wasn’t a surefire NBA first-round pick last spring when he opted to return as a sophomore, and he’s now sitting at No. 57 in Draft Express’ latest mock 2017 draft. That isn’t an upward move. If and when Trier does return, Givony said, he will be judged on whether the Wildcats become better with him. As for whether the PED use itself will affect his draft status is hard to determine, he said, because Trier hasn’t revealed enough information. “I think the details really matter of what he took, who gave it to him, and what were the circumstances,” Givony said. As well as the Trojans are playing this season, it hasn’t translated into much of an environment at Galen Center. USC was averaging only 3,646 fans a game entering Thursday’s game with Arizona, when only about 4,000 were on hand for tipoff – and probably 1,000 of those fans were rooting for the Wildcats. The combination of the 6 p.m. tipoff and Los Angeles traffic no doubt didn’t help. By halftime, Galen Center appeared to have 5,000-6,000 fans on hand and the crowd noise picked up when the Trojans made a push in the final minutes. Not only was Lute Olson taking in Thursday’s game while sitting directly on the Arizona-side baseline along with wife Kelly, but he also received a “bonus” at halftime. USC staffers set up a table right in front of Olson that featured a fan trying to move pingpong balls with a spoon in his mouth. The fan’s goal was to spoon over more pingpong balls to another bowl than USC guard Elijah Stewart did during a taped segment. The entire contest — and Olson — was shown on the Galen Center videoboard as fans cheered. Stewart won, however. Lakers coach and former UA forward Luke Walton appeared at Thursday’s game holding his son, eventually settling into a seat one row behind the UA bench. While Luke wore a red Arizona sport shirt, his son was dressed in purple Lakers gear. Former UA guard Miles Simon also sat a few rows behind the UA bench, near the parents of Southern Californians Parker Jackson-Cartwright and Chance Comanche. Instead of spending their entire weekend at a Manhattan Beach business hotel as they have done in recent conference trips to Southern California, the Wildcats opted to split up the weekend this time. They stayed in downtown L.A., just three miles from Galen Center, on Wednesday night and until gametime Thursday. Then, after the USC game, they were scheduled to pull into an upscale Santa Monica hotel just a block from the Pacific Ocean. While getting swept in L.A. last season might have prompted a change from the more superstitious coaches out there, UA basketball operations director Ryan Reynolds said the move was more about traffic and shaking up the routine. By staying in Santa Monica, the Wildcats will be close to the Los Angeles Clippers’ westside practice facility, where they will practice Friday, and not too far from UCLA for Saturday’s game. “It’s a little closer to UCLA, and it was time to try something new,” Reynolds said. UA coach Sean Miller now has the Wildcats pack their bags for a new hotel immediately after every opening game of a two-game Pac-12 road trip, including short hops within the San Francisco Bay Area and Oregon’s Willamette Valley. “What did he take, Kryptonite? Five months is a long time for anything to be in your system. Take it from a guy who has put a lot of things in his system.” — Former UA and USC coach Kevin O’Neill, speaking on the Pac-12 Networks pregame show, according to Tucson News Now’s Anthony Gimino. 50.0: USC’s second-half shooting percentage, after the Trojans made only 8 of 31 shots (25.8 percent) before halftime. Lauri Markkanen had 23 points to lead Arizona.